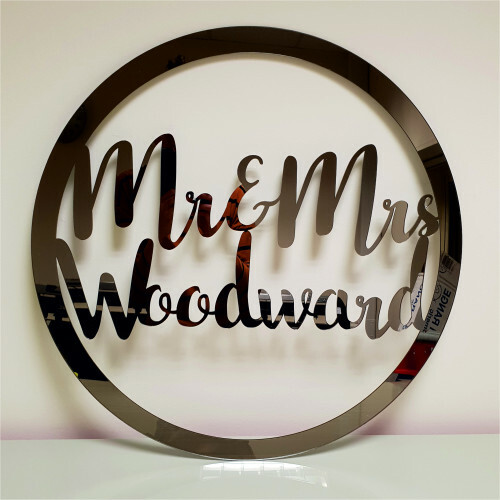 3mm acrylic laser cut with a personal message of your choice and your name(s) added for free. A beautiful and elegant display for any occasion; wedding, birthday, christening, baptism, anniversary... design your own! Mirror acrylics are coloured on the face and silver / grey on the reverse. Image shown is bronze mirror. To add your own message: Please add the message you would like to appear on the item in the 'notes' section of your order or by separate email we advise no more than 10 characters per line, the less characters the better it will look, if we believe the writing will be distorted we will contact you prior to manufacture. If orders are received without a message we will contact you via email to confirm this. Any delay in responding will delay your order. Notes will be added EXACTLY as written in the notes section so please check all spellings as these cannot be amended once produced.